Soup has come to symbolize the ultimate in comfort and safety. Many years ago, when I was about fifteen, I saw someone served a cup of soup, and this vision, which had all the sentimental charm of a painting by Sir Edwin Landseer, is indelibly imprinted on my mind.It was a cold, rainy autumn night and some grubby teenagers had gathered at a friend’s rather splendid house. We heard the crunch of a car on gravel. A taxi pulled up and into the wet night stepped the friend’s older sister, who was coming home from college for the weekend. She was probably nineteen but she looked liked the picture of sophistication. She wore brown pumps, a green tweed suit, pearl earrings and her hair was pulled back in a French twist. — "Soup," from Home Cooking, by Laurie Colwin. It wasn't wet tonight but damn, it was cold. I cannot deal with with the extreme months of the year, the brutally cold and the beastly hot. During February and August I become something of a lunatic. Soup is out of the question in August. In February, it is essential. 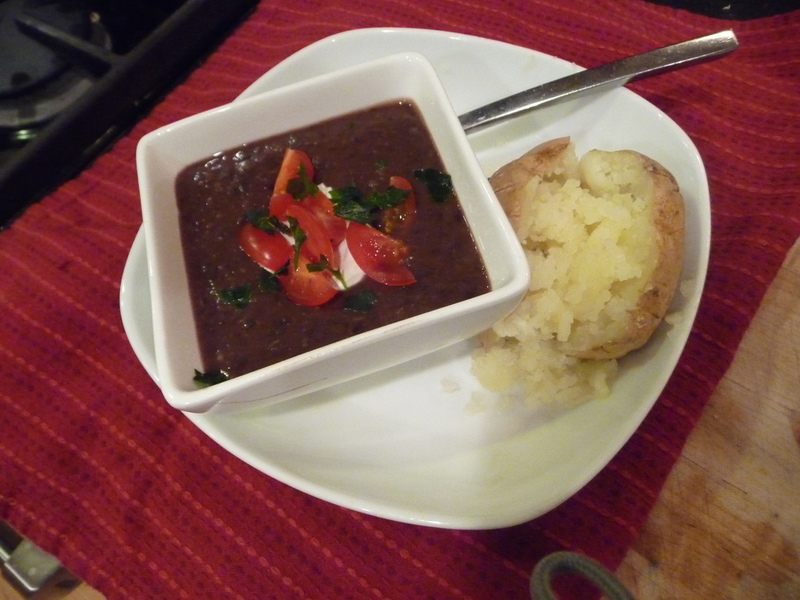 Tonight I had black bean soup on my mind, and cans of black beans in the pantry. Some die-hards will insist that dried beans make the best soup, and I can appreciate that but usually I am thinking up what to make for dinner an hour before we eat. You can't soak beans in an hour. 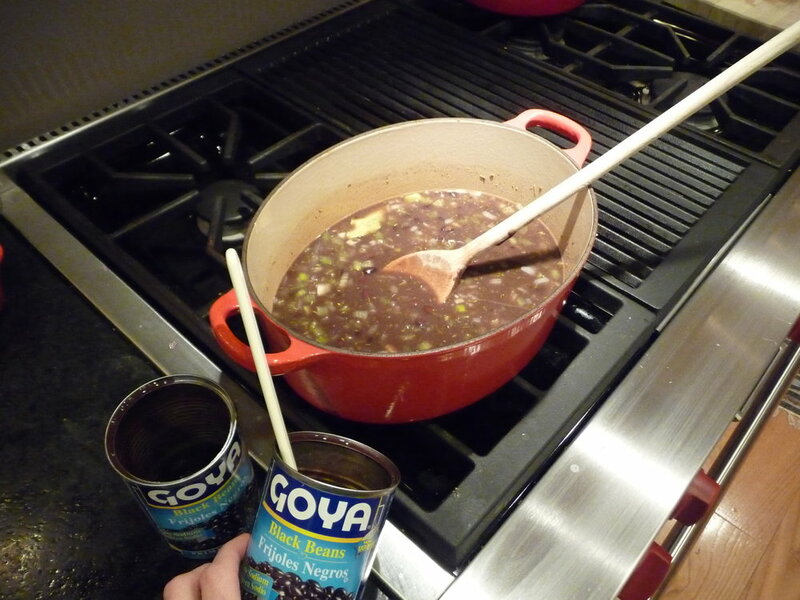 Someday I will try dried beans but for tonight the canned was fine, along with my trusty recipe that I wrote down a thousand years ago from the back of a can of Goya black beans. This recipe did not contain a diced onion or celery, both of which I added myself because it seemed logical to have them. Some black bean soup recipes have carrots but I feel they make the soup a really weird color. It's all preference. 3 cans black beans, not drained. Heat olive oil in a soup pot over medium heat. Add onion and celery, saute 5 minutes. Add garlic, cumin, oregano, pepper flakes and bay leaves, and bouillon cube. Saute another 5 minutes until bouillon is dissolved. Add water, sherry, brown sugar, and vinegar. Stir to combine. Add beans, stir well. Lower heat, cover and simmer at least 15 minutes to let flavors meld, but you can keep it on a low flame as long as you need. You can serve as is, or puree in a blender or with an immersion blender. I like mine with a dollop of sour cream or greek yogurt, some quartered cherry tomatoes, and chopped fresh parsley or cilantro. And a baked potato (Jeep's idea).